After a six month journey and gripping landing sequence, NASA’s InSight lander has already returned its first image of the Martian surface. 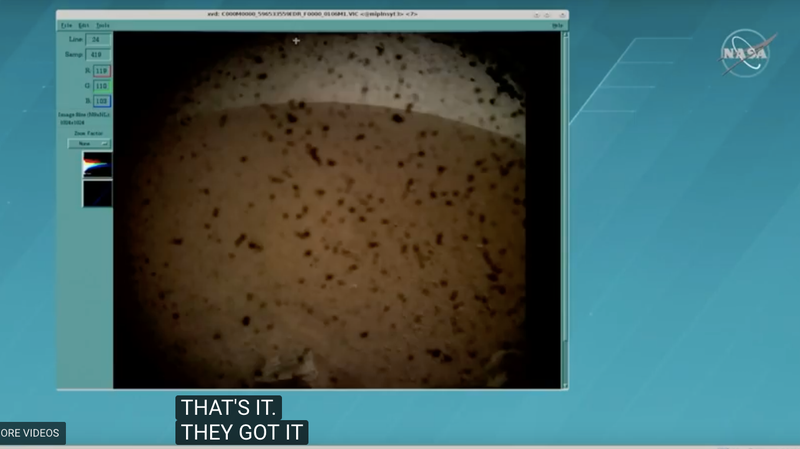 The image shown on the NASA stream demonstrates dust speckling InSight’s camera, and it shows what appears to be the Martian horizon. InSight flew to Mars carrying three scientific instruments, one for measuring heat flowing out of the planet, a seismometer, and a radio antennae measuring the position of Mars’ North pole. It successfully deployed its parachutes, fired its thrusters and landed today, at 2:54 PM ET, accompanied by a pair of CubeSats that relayed data back to Earth. At 3:01 PM ET, InSight pinged the Earth directly. It wasn’t clear whether or not the probe would immediately return an image, as it touched down onto the surface and waited for the dust to settle. But, to cap off a flawless landing, the probe successfully beamed back the photo to the applause of NASA scientists. The camera that returned the image will be used to figure out where InSight’s robotic arms will place the probe’s instruments. InSight’s landing was a sucess—now the science begins.